A very long time between posts and plenty of new content planned but I thought I’d start with something quick and easy. Both to cook and for me to write up while I get my blogging mojo back into gear. My go-to winter food is soup. I love it. 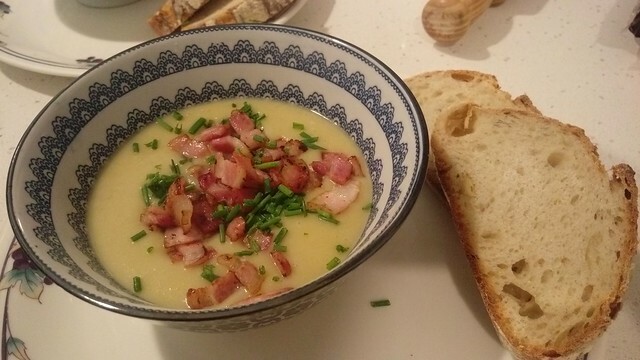 Unfortunately, Andy isn’t such a fan so we don’t eat quite as much of it as I’d like … but fortunately the need to very quickly dream up a meal meant that leek and potato soup, topped with tons of bacon and chives was on the menu. It’s also fortuitous that I’ve just completed a bread making course, thanks to Le Cordon Bleu (details on that to follow) so we had some potato and rosemary sourdough bread ready to go – the perfect accompaniment! I’ve written about soups before – and this is in the same vein. It’s hardly a recipe – it’s more about the flavour combinations. If you like your soup thicker, use more potato and less water/stock. If you like it thinner … use more water/stock. I think that a good rule of thumb is to cook the soup with the water just covering the ingredients and then let it down if you want to, after you’ve blitzed. Serve with fresh bread, or toasted bread, thickly spread with butter! Warm the olive oil in a big pan and add the chopped onion and leek. Sweat them down until they're relatively soft, but avoid the temptation to crank up the heat, as you don't want them to pick up too much colour. Add the chopped potato and the stock so that the vegetables are just covered and boil (covered, otherwise you'll evaporate off the liquid!) until the potatoes are cooked. The smaller you cut the potatoes, the less time this will take. Keep an eye on it as it cooks, as even with the lid on you may need to add a bit more liquid. As the soup is cooking, cut the bacon up into small pieces (lardons, if you like) and fry them off in a separate pan. We like them nice and crispy. Once the potatoes are soft, turn off the heat and blitz the soup until it's nice and smooth. At this point, add more stock or water if it's looking too thick for your taste. Adjust the seasoning too. When you're ready to serve, ensure everything is hot, then ladle the soup into bowls, topping with bacon and chopped chives. Beef and horseradish is one of my favourite things. However, it’s not something I’d associate with salad. More with a massive roasted joint of meat, lots of crispy, beautifully rendered and seasoned fat served with lots of roast vege and maybe even Yorkshire puddings. Weather-wise, we’re not quite into roasted meat territory here. 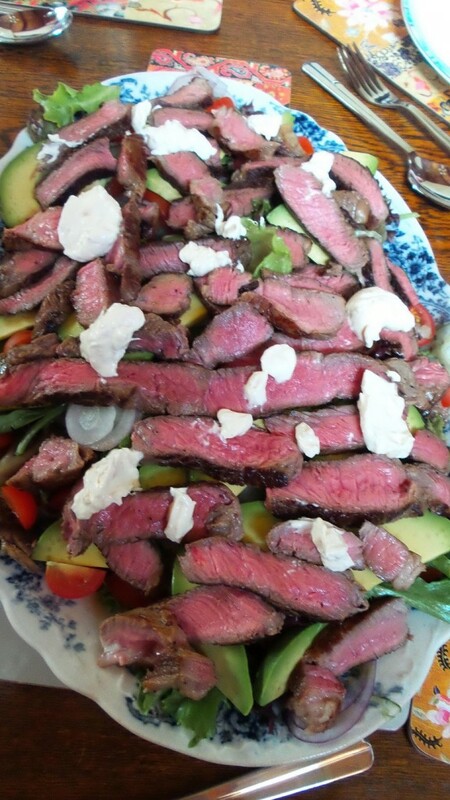 But this salad is a great way of enjoying beef and horseradish even if you’re cooking on the BBQ. It doesn’t need to be served hot – we had this as part of our Easter feast and the meat was cooked in advance and left to rest. The salad (bar the avocado) was prepped in advance, as was the dressing. This meant when it came to serving, all I had to do was cut the meat and the avocado and we were good to go. I daresay this is pretty healthy but it’s also delicious and easy. I recommend cutting the onion and cucumber using a mandolin – otherwise slice as finely as possible. You might want to hold off chopping the cherry tomatoes until the last minute too. This recipe is based on one I found on Taste. I’ve made changes to suit the household’s preferences. Get the steak out of the fridge around half an hour before cooking. Heat your favourite steak cooking pan with fat of choice (we use olive oil, my parents swear by a mix of olive oil and butter). Season the steak well and cook in the hot pan until done to your liking. Don't over crowd the pan - if you've got closer to 800g of steak you'll need to do at least 2 batches. Set the steak aside to rest (covered with tin foil). To make the dressing, mix the sour cream, horseradish and lime juice. This is a thick dressing - not a pourable one - so you don't have to add loads of lime juice. To create the salad, in a large bowl toss the leaves, onion and cucumber. Spread evenly over a large serving platter. Before serving add the sliced avocado and the quartered cherry tomatoes. Finely slice the beef and add this to the top of the salad. Dot the dressing over and serve immediately. Pass the dressing separately so people can add more if they wish. School is back and we really need to get back into our menu planning. Not only does it get us organised, it also means we try out new stuff. Last week we enjoyed a prawn curry recipe which came out of one of my old Olive magazines. I’d last made it in 2004 and written it out on a card to go in my recipe box. The Olive magazine was excellent (it may well still be – I’m just not in England buying it any more!) and that inspired me to delve into the cupboard where the mags are languishing and fish one out at random. Which is funny because I pulled out a March issue: the recipes were the antithesis of seasonal and it seemed to have a strong baking focus. I’m not sure that either treacle or bakewell tarts would have cut it for dinner. So even though I didn’t like the sound of ‘spicy lamb and prunes on pistachio couscous’ it was my best bet. It was from a section on weeknight food, where the recipes are for 2 and promise to be ready in 30 minutes. I often find that these kind of timings are at best optimistic and at worst erratic. However, in this instance, it was pretty close to the mark. I made work for myself because my prunes were stone in and I made up my own harissa-like marinade, but they’re definitely optional extras. I’m so glad I tried this because, despite my reservations, it was excellent. The bonus was that my butcher sold me the lamb neck fillets for just $10.99/kilo (I was expecting to be in backstrap territory but happily no!) making it a very cheap meal. You do have to be careful cooking lamb neck. You either cook it long and slow (often on the bone in things like curries) or super-fast. This is definitely the latter. On the plate it was occasionally a little tough to cut but in the mouth it was fine. Whatever you do, do not omit the mint. It gives the dish a fresh lift. I cannot recommend growing your own mint highly enough – it does require quite a lot of water but you are rewarded with a vigorous and easy to grow herb that has plenty of uses. Adapted from Olive magazine, March 2004. This serves two but the chances are you will have a little left over. Begin by mixing the lamb and harissa together in a bowl. Set to one side to marinate. Put the prunes in a mug and just cover with boiling water. Set aside. Put the couscous in a bowl, pour over the hot stock. Cover and set aside. Heat a dry frying pan. When hot, add the lamb and cook for 2 minutes on each side so it's well browned. Lamb neck does have some fat on it so you probably won't need to add any to the pan. If you do, only add a little. Add the prunes and what remains of their soaking liquid. Allow the water to bubble and scrape the bottom of the pan. This is your sauce after all! Cook until your lamb is cooked how you like it. Mix the walnuts through the couscous and stir the mint through the lamb just prior to serving. 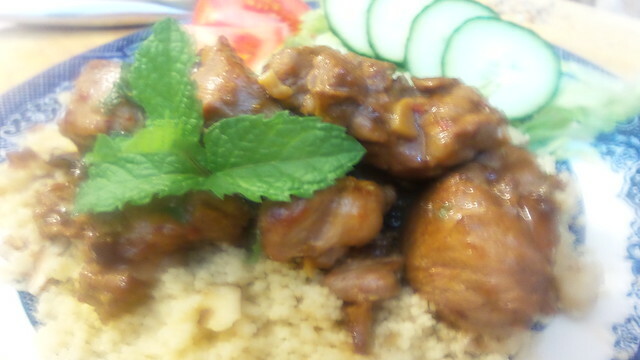 Serve the lamb and prunes on top of the couscous, with lemon wedges on the side.